A Site Diary is where a competent site supervisor initially records any occurrences on site. It is used to save day-to-day site activities. 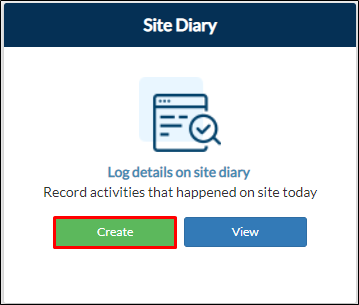 From your project page, go to Construction > Create on Site Diary tile. From your navigation bar, go to Construction Phase > Site Diary. Or you may type in 'Site Diary' on the search bar located on the upper right corner of your portal. 2. Select the Project Name. This field is required. Note: Project name will be hidden if you created site diary inside your project. Project address will also be populated based on the selected project name. 4. You can attach files using the Upload button. 5. Click Submit. You can see all the submitted forms on the Site Diary Report.